If you follow me on social media, Instagram in particular, then you may have noticed I've undergone a little change. Actually it's a big change if I'm totally honest, and not one I expected at all, when I walked out the door last Thursday afternoon. 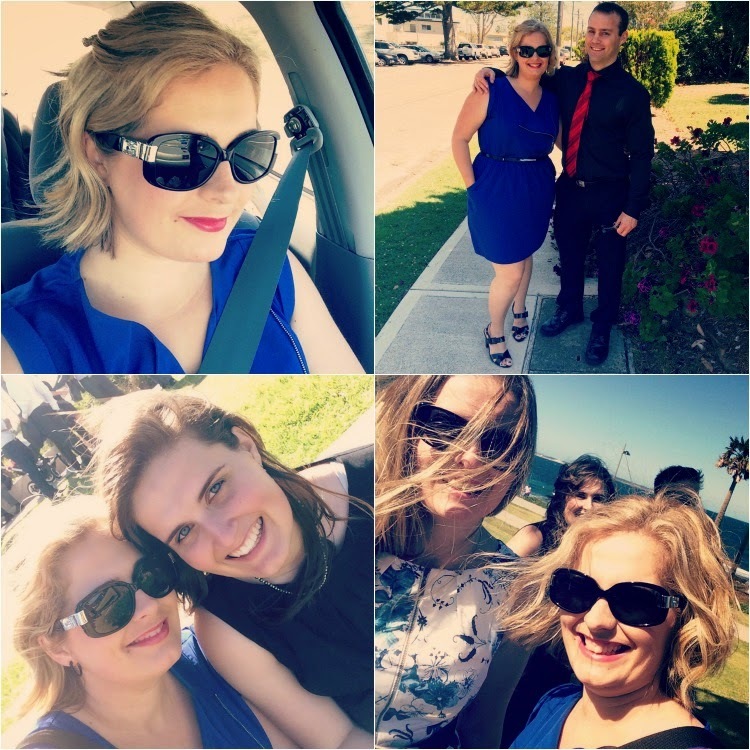 You see, it was my cousin's wedding on the weekend, and I of course wanted to look my best for her big day. Dave's Mum was looking after the girls for us overnight and we were staying with my sister and going to enjoy a glorious kid-free day and evening. As many women often do, I booked myself in to the hairdresser for a couple of days. The plan was to get a trim of the haircut I got 6 weeks earlier, that in itself was a big change as I cut my hair from mid-lenth to above shoulder-length. Get a few foils to disguise the massive regrowth from the last lot I got months and months before, and have it curled, so that by the time the wedding rocked around a couple of days later I'd be sporting some nice waves rather than a giant fuzz-ball! Somehow though, I walked out of there a blonde! Don't get me wrong, I actually don't mind it. In fact it's something that I've thought about doing on and off for years, along with going jet black too. I can't say it's done my hair any favours though, as I can feel how damaged my hair now is from the whole process. It's not what I asked for. What I asked for was a trim, and a half head of foils. Nothing dramatic I said, just a few highlights to hide the regrowth of the old ones. What I got was bombshell blonde! It was a bit windy at the ceremony. Good thing I took the obligatory selfie before we got there! I have struggled for most of my adult life to find a decent hairdresser. There was a short period when I thought I'd hit the jackpot, and that was while I was pregnant with Punky. Only problem was, she was pregnant too. And so a month after I had Punky she went on her own maternity leave and she hasn't returned since. So I've been testing out the other girls at the salon and sadly I just don't seem to have found that same magic that I had with Tammy. I know, I know, first-world problems and all that, but finding a good hairdresser is a very rare thing for me. I want to know that when I sit down in that chair, and hand over a fistful of cash a couple hours later, I'm going to be walking out of there with what I asked for. And I don't think I am going to get that where I've been going the last few years. So now I am on a quest to find a new hairdresser. Normally I would leave it a few months or even longer between visits, but I have a feeling that being a blonde and the subsequent re-growth I'll be sporting, I'm gonna need a follow-up visit sooner rather than later. 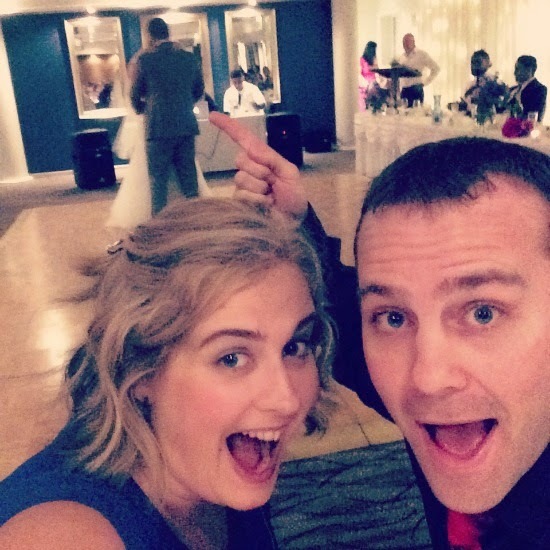 Picture of the Bride & Groom's First Dance? And so the quest begins. If you know of any good hairdressers in the Hawkesbury/Hills area, please let me know! 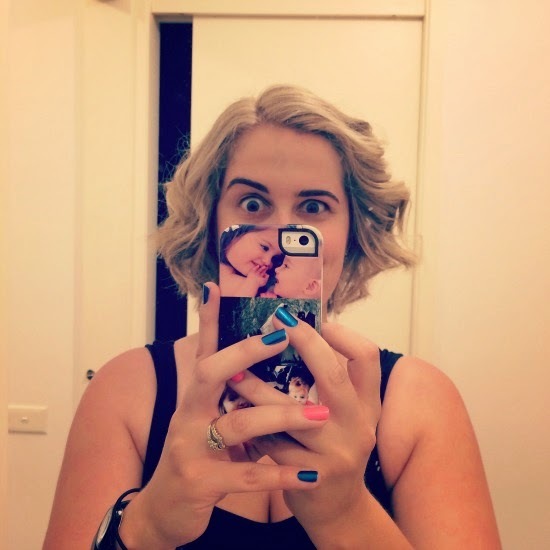 Have you ever walked out of the hairdressers with something completely different to what you asked for? Do you have a good hairdresser or do you have bad hairdresser luck like me? On the plus side it looks FABULOUS! On the downside, I'd be slightly more than upset that I didn't get what I asked for. Can't help with the hairdresser thing I'm afraid seeing as I'm in the UK but good luck! I'd be so annoyed! It looks great, but that's not going to be your first thought when you look in the mirror! I've had that experience with length - a trim became INCHES and suddenly I had a bob again. So the curls came back. I HATE MY CURLS! Also getting waxed - just an eyebrow tidy, please. Nope. Pencil thin. Two days before my wedding. TEARS TEARS TEARS. It looks good but I'm guessing it will now be high maintenance. The hairdresser should have talked you out of a half head of foils and suggested just a few foils to lighten things. I'm casing hairdressers at the moment too. As soon as I find a good one, they tend to up and leave the state/country. Phd for hair has just opened in Carlingford. They are awesome...at least their Parramatta salon is. Sam is my girl...she got me through 2 post partum hair falls. All I have to do is walk in and sit down and say "fix me" and know that it will be done. As a teen the hairdresser did blonde streaks, mixed the bleach wrong and burnt half my hair so badly that it was brittle and stretchy like elastic for months! A couple of years ago, I went in with a pic of Jennifer Aniston, like so many before me, only I wanted the honey gold colour- not the layer cut. I came out with dark, dark brown hair with a few brassy foils on top. I said it wasn't what I wanted but was assured it would be by the time I'd washed it a few times. It wasn't. Not even close. Another time (different salon) I asked to go from blondy-brown to a copper red. Came out with dark brown hair. When I complained I was told it was red but that if need sunlight to get the full effect. Um. No. That same salon, when I took my DD there, argued with me over the style she wanted. I said she wanted a concave bob cut and that was what they should do. They argued she was "too young". I said she was not, could the please just cut it or we'd go elsewhere. They cut it but it was barely concave. Never went back. The hairdresser I have now is amazing. I've been pretty lucky in the hairdresser stakes. Most of the time though I think I straighten it better than they do! Oh you look stunning! But i get this, really get this. A good hairdresser is hard to find and even when youd o find one - the relationship needs a lot of work to keep it a happy one. I'm wondering if I need a new hairdresser too? Ohhhh the guilt! For starters, I like it! But I can understand your reservations about regrowth. Secondly, I haven't found a good one since moving. I had a trim on the weekend and it cost me $38 and my fringe looks worse than when I hacked it a month ago. You look awesome! I know the feeling of not having your hair quite as you want it. I went to a hairdresser a few years ago who ruined my hair. She managed to damage my hair so bad with the foils she used that not even 1.5 hours or colour removed at a different salon could get rid of it. I've finally got a decent hairdresser who is affordable and knows what she is doing. Best of all, she is completely honest. If she thinks that colour won't work on my hair, she says so and tells me instead what she can achieve. It's seriously a breath of fresh air! I've been blonde my whole life, so I don't know whether we have more fun, but we certainly have a lot of fun! I think your hair looks totally orse, but you're right about the regrowth. I'm back in the chair for more foils after two months if I'm lucky! I've always chopped and changed hairdressers as often as I've changed my style. I just never found "the one." Then I came to live in Australia and stumbled upon my gem in Neutral Bay. Perfect results every time. Good luck in your quest for the perfect hairdresser! I had to leave a hairdresser once because I assumed he was gay and he wasn't. In my defence this guy flapped around like a wounded albatross, had just spent the last hour showing me photos of his boys trip to San Fran where he was naked and covered in feathers and glitter and then brought up the Mardi Gras in Sydney and I asked if he was going and he was all 'I'm not gay!'. It was very strange and I never went back.